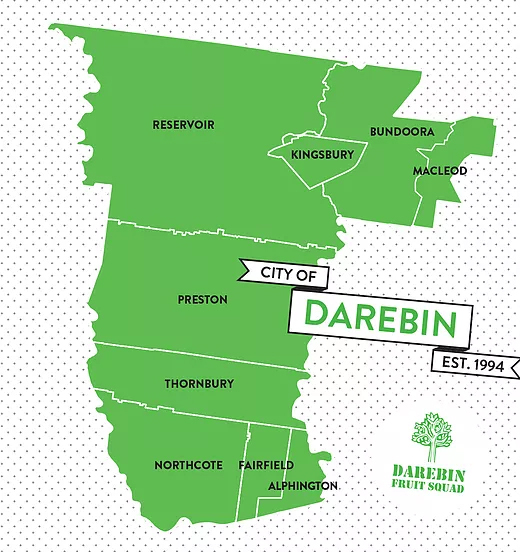 The Darebin Fruit Squad (DFS) a community fruit harvesting project; a group of volunteers who harvest excess fruit from households in the Darebin municipality. The fruit is given to Food Security organisations like and including DIVRS, who distribute it to food insecure people in Darebin. We currently have 16 volunteers who assist with tree auditing, fruit picking, tree maintenance, fruit deliverery, publicity and some of the administration. The DFS was an initiative of Transition Darebin, evolved in partnership with Jika Jika Community Centre and now is a program of the Darebin Volunteer Information Resource Service (DIVRS), along with support funding from Darebin City Council. In the first year of its existence, DFS have harvested and helped to re-distribute over 1,000kg of fruit grown in the backyards of Darebin properties. Home-owners and renters, young and old have donated their excess fruit, and this is just the beginning.